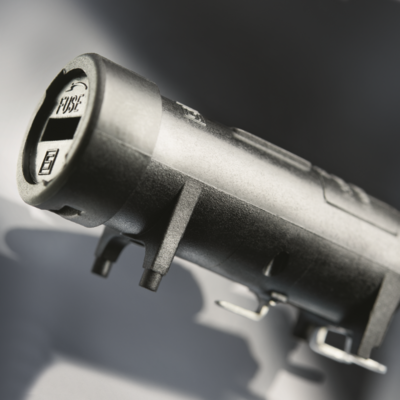 SCHURTER now equips its FPG7 shock-safe SMD fuseholder with two stabilizing posts. The added posts extend from the existing front standoffs, providing increased stability during board assembly, and when replacing the fuse. With rated power acceptance of up to 2.5 W at 10 A / 250 VAC according to IEC, combined with rated current of up to 16 A at 400 VAC according to UL/CSA, the fuseholder can be used for applications requiring primary protection. Overall, the it is well suited for applications where the following requirements must be met: SMD assembly, compact design, primary protection, and external access to fuses. Specific applications in this regard include industrial and medical equipment as well as household appliances. Depending on the application, the customer can select between two fuse cap options, either a slotted version for screw driver access or fingergrip version.